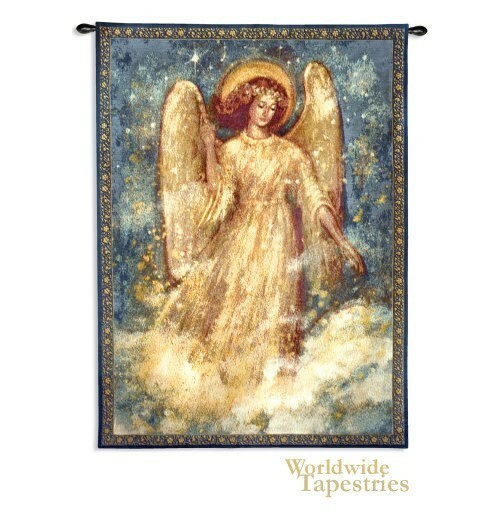 This Christmas angel tapestry "Joy to the World" shows a beautiful angel on a cloud in the starry night sky. A golden halo surrounds her head to signify her pure and holy spirit. The way she floats amongs the clouds is just beautiful in this work. One hand points up towards heaven to symbolise her connection with the creator, and her other hand is held towards the earth to symbolise her compassion and love for the earth. This angel tapestry "Joy to the World" is lined and has a tunnel for easy hanging. Note: tapestry rods, where pictured, are not included in the price. Dimensions: W 37" x H 53"